From the start, it’s a jolt, a shot in the arm full of passion and enthusiasm as women talk about why they love and make comics. 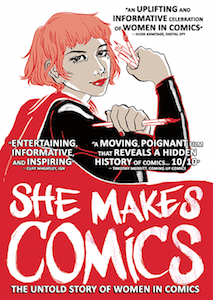 Simply seeing so many women puts the lie to comics being a male-oriented medium, but the content goes on to point out key names and accomplishments in history, accompanied by archival footage and images. and many others, including many young creators, as well as a few men, including Paul Levitz and Chris Claremont. Key moments explored are the original diversity of comic genres, the rise of underground comics, convention cosplay, the founding of Friends of Lulu, internet fan culture, the importance of key titles like Elfquest, X-Men, Sandman, and Captain Marvel, and the rise of indy and webcomics supporting diversity. Levitz makes the essential point that simply having Kahn in a leadership position brought in more women, since they saw that there was a space for them. That’s an idea DeConnick returns to, the importance of providing visibility of achievement to the next generation.